Academically and professionally qualified kind caring son is sought by Colombo suburbs B/G parents for their pretty, fair, kind, well mannered science graduate daughter. 1988 Dec. 5’4” holds MSc in food science. Currently working as a chemist in a reputed multinational company. Please reply with horoscope and family details. Academically and professionally qualified NS,​well mannered and caring son,​is sought by Buddhist /​Catholic professional parents for their pretty,​fair,​kind 34 yrs,​5’5” daughter (Case Manager) higher educated and employed in Australia. Marriage limited to signature only. Separated due to incompatibility. A son currently living and employed in Australia is preferred. Reply with full family details and copy of horoscope. Gmail: h​e​r​a​t​h​p​r​o​2​0​1​8​@​g​m​a​i​l​.​c​o​m​Cont. 0413483062. Buddhist 35+ yrs Tamil Sinhala mixed Sinhala educated 5’6” tall only daughter. She has a management degree. Now she following a MSc degree in Australia. She worked as an English Teacher 4 yrs. After followed a Hotel Management diploma course. Race Religion immaterial who are living Australia, NewZealand can apply. Gampaha B/​K retired Assistant Secretary /​Lawyer father Teacher mother seek academically professionally qualified son for their daughter (only child) born in 1981 June 5’2” BSc.,​MSc. Teacher with more assets. Kuja 8. Reply with horoscope. G/​B family seeks an educated professional partner for the youngest sister 1972,​5’3” MSc Graduate Executive in a semi-government institution,​inherits considerable assets. Reply with horoscope & family details. G/​B,​family living in Colombo,​father retired Senior Executive in government sector,​mother housewife,​seek kind,​educated,​professionally qualified well employed in Sri Lanka or abroad,​having good family background,​groom for their daughter with good character,​64 inch,​slim,​fair,​pretty,​28,​Visakia,​having B.Sc. Management Degree and CIMA,​presently working as Executive at Global company,​having assets. Please reply with horoscope copy,​family details and contact Nos. in first letter. Email: k​a​v​i​r​a​n​d​e​n​i​y​a​9​@​g​m​a​i​l​.​c​o​m​or via newspaper. 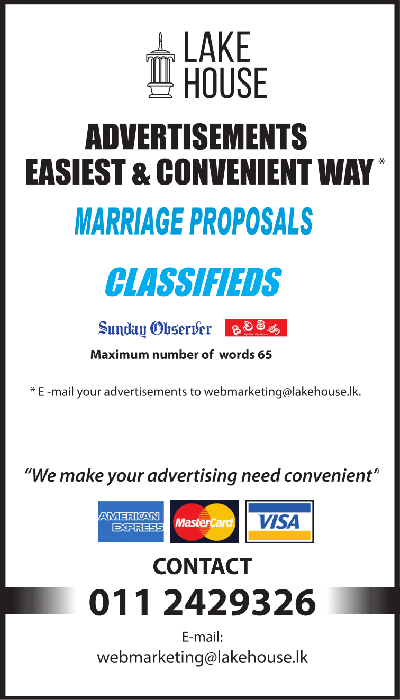 Ja-Ela - Roman Catholic Sinhala parents seek a suitable partner for their daughter who has a pleasant personality age 36,​height 5’6”,​educated,​employed in a leading organization,​owns a land close to the main road and a motor vehicle. E-mail: s​h​i​r​a​n​i​j​u​s​@​g​m​a​i​l​.​c​o​m​Divorcees may not reply. Pretty lady late 50’s needs companion age over 65 yrs. Preferred Christian foreigner also welcome. Email r​a​n​j​a​n​i​e​0​0​1​@​h​o​t​m​a​i​l​.​c​o​m​with your contact No. We would like to welcome into our family a son age between 40 - 43 academically and professionally qualified who comes from a loving and stable family,​non smoker,​for our well brought up daughter,​a lawyer by profession. She lives and works in Australia. She is born in 1979,​slim,​fair,​smart and attractive and has never been married,​an avid reader,​enjoys good films and theater as well as music. She likes a kind caring and understanding partner serious about marriage and family. She is also a dual citizen. No divorcees please. Religion and caste immaterial. We,​parents are a mixed religion B/​C. Please reply to v​a​l​e​n​t​i​n​e​8​9​2​4​@​g​m​a​i​l​.​c​o​m​Horoscope is available,​if interested. 1983,​5’ B/​G mother from Galle seeks a suitable partner for her graduated daughter employed as an Accountant. Reply with horoscope and details. Email: p​r​o​p​o​1​4​5​@​y​a​h​o​o​.​c​o​m​011-2853522.